Just released a new update for FSXGET correcting bugs regarding x64 and non-English systems. Download and more information here. Anyone remember the wikiscanner, a tool cross-referencing IP ranges known to belong to a certain company with IP addresses of Wikipedia article edits, thus exposing which companies have edited their own Wikipedia entries (and what they’ve edited)? I did really like this project unlike most politicians, governments and companies exposed by the tool I guess. Anyway, it’s time for Vol. 2! Books that make you dumb! 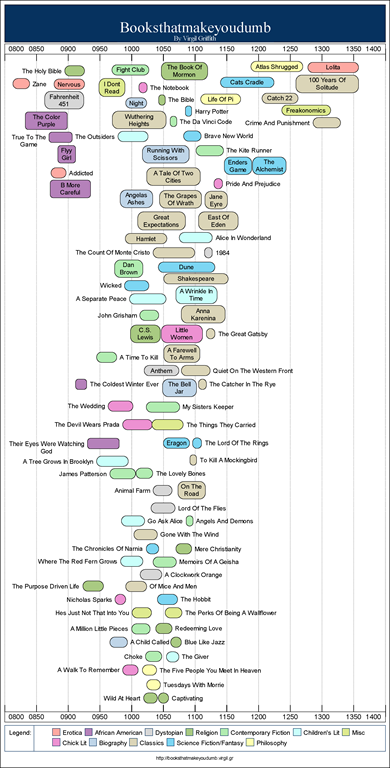 Of course, one can argue about any causality in this and apparently not too few people were quite willing to do so as the author states on his website but there’s actually not a single word on his website blaming any of those books for dumbness or cleverness of its readers. Just consider it a fun thing and enjoy reading through the list! Most people reading this probably won’t find it very funny. I do though! 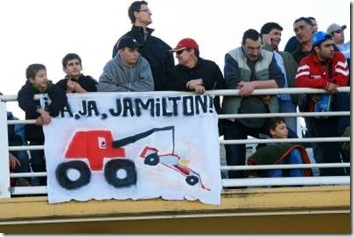 I can’t say whether I like it more for its being a joke about Hamilton (I’m a Ferrari fan) or the Spanish stubbornness of pronouncing foreign words the way they fit best into their own language regardless of how they should be pronounced or how absurd they might sound, which puts another joke in the banner below. 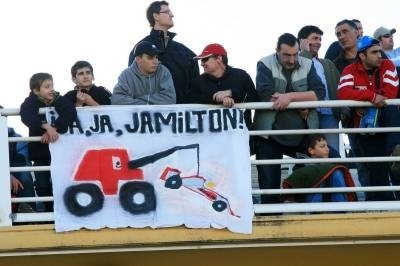 Anyway, I just couldn’t help smiling when I first saw it. I’ve just found out that one of my projects, a web-based planetarium found a mention on a Taiwanese blog. It’s the blog of a programmer from Taiwan whose application I used in my project and who helped me out with some problems I had when trying to adapt his application to my needs. You can see his blog entry about my project here. But anyway, I’d like to use that chance to thank him again for his help. He did really save me a lot of time just as did his application. 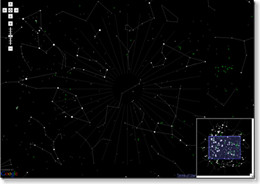 So, thanks again starryalley for your help and keep up such a good work with mobile starchart. This is going to be a short post about my first year of experience with Windows Vista. Now I’m not gonna tell you that you should use Linux or Windows XP instead of Vista which is really really bad, as you can read on so many blogs and forums but I want to give an honest opinion on Vista’s look and feel and point out some things which are pretty odd and which I really can’t understand. So first of all: I actually like Windows Vista. Built-in search, nice GUI and especially that extremely improved way of navigating folders in Windows Explorer are features I benefit from. Control over thumbnail sizes is another nice feature of Windows Explorer. The sidebar is ok, too, though one can clearly see that Microsoft didn’t spend too much time developing that one. 1) During the first few month of usage, I couldn’t plug-in any USB flash drive with more than 500 MB, as Vista would crash with a BSOD (blue screen of death) in result. Man! How did Microsoft achieve such a bug?!? I’m not talking about that very special time dilating warp plasma machine I’m trying to connect via USB… it’s a USB FLASH DRIVE. I’ve been really annoyed by that matter but couldn’t do much about it. Finally after few months living with it, some Microsoft fixed the bug and since then, I’m able to use my 2 GB flash drive again. 2) Windows BackUp tool! It’s gotten a clearly improved GUI, I must admit that. But for the cost of features which are now missing. It’s no longer saving to some *.bkf file but to *.zip files each of which cannot be larger than 100 MB. So you end up with dozens of *.zip files in the end. But the most annoying thing is that it can no longer backup EFS encrypted files. They are just left out. There’s no longer any way to backup them in Windows Vista, besides doing it manually. But why?!? All you gotta do now to keep files from getting backed up is to set that ‘encryt file’ checkbox in Windows Explorer. Aren’t encrypted files important?!? Now I have that nice and easier to use BackUp tool (NT BackUp was clearly outdate) in Windows Vista, but it’s not worth a cent as I’m not even using it. I need ALL my file to be backed up not just some of them, so I have to use some other backup solution. 3) Same with Windows Disk Defragmentation. Now it’s got an easier to operate GUI but somehow Microsoft forgot to include some kind of program feature. The disk fragmentation visualization overview is gone, too. I can understand the latter one, as for sure, it has never been too accurate and more than a nice to watch animation but what about the progress indicator? Somewhere on the web, I have read that it’s been inaccurate, too. Well, be it so but at least you had some hint at all on how long defrag will take. Now you’re left with ‘disk defragmentation may take from few minutes to various hours’. What the h***!!! A SIMPLE PROGRESS BAR WOULD HAVE DONE THE JOB! How can having no idea at all on the duration be any better than an inaccurate prediction? 4) This one’s again about progress indicators. Now in the case of copying files. I thought the times of ’3772653665387752 minutes left’ predictions till copying files is done were gone since Windows XP. Windows 95, 98 and ME had this problem. Not that I really missed it in XP but now I guess, I should thank Windows Vista for reviving it!!!!!! But besides that little bug Microsoft has tried hard to improve the file copy dialog. Now shows the transfer rate and waits and usually makes quite accurate predictions on the duration. But I don’t quite get how Microsoft does calculate it. Must be some numeric approximization of a really complex 5th order integral equation! Why? Because it usually takes 30 to 40 seconds, sometimes even longer till Vista gives you that number after starting to copy files. Till then you can read ‘Duration: calculating…’. 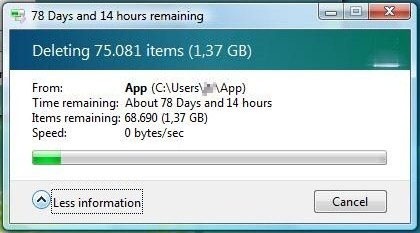 This is annoying as many file transfers are even done by the time Windows has finished calculating the duration but it’s even worse for the fact, that after just a few seconds, Vista shows you a stable and accurate transfer rate in the copy dialog together with an also accurate size and number of files that are being copied. By that time, you or a eight year old child can calculate (just using your head, not even a calculator) the duration of the transfer within three to four seconds, sometimes even faster. This way, you have the result 30 to 40 seconds before Windows Vista does! That’s probably the worst thing at all in Windows Vista. Mostly because I just can’t understand, even after thinking about that really really hard, how and why Microsoft does that! Anyone explain it to me? Please! PS: Number 1) and 4) have been resolved by now. 1) by some Windows Update months ago, and 4) by Vista Service Pack 1 which has been available as a Release Candidate for a few weeks now. No, that’s not gonna be some ‘you should use Firefox because it’s better and faster and safer and…’-article. In fact, I don’t even like seeing those words on official or semi-official Firefox banners. 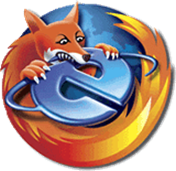 I’ve been an IE user for years until five years ago I switched to Firefox and fell in love with it. 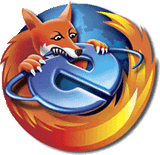 I definitely prefer Firefox over IE but for various reasons and with ‘faster’ and ‘safer’ NOT being among them. Basically I just like it for the many extensions there are and a few details I really enjoy. Anyway, few days ago, I came across an icon while surfing the web, which I just wanted to show. Though it might look this way, I just want to point out: I really don’t have any problem with IE. It’s a nice piece of software, too, and who ever likes it is free to do so! However, I like the idea of that icon! Close to the official one at first sight but with that but with those pearly white little details… ehh… and that blue ‘e’ ;-) Just a creative, nice piece of art! As you can see, there’s gonna be an update to my website. This is mainly to simplify things a lot and use only one CMS, namely WordPress. I still have to figure out whether it does the job or not but I’m pretty positive on that. Till migration is complete, you can still visit my old website at http://www.juergentreml.de/joomla/. Migration is complete. The old website has been taken offline and is no longer available.